Simple. Easy. Perfect. Easy Mango Salsa takes only minutes to prepare, and adds a burst of fresh flavor to your favorite Mexican dishes! This Easy Mango Salsa is so easy, I have put off writing a post for it for quite literally YEARS. Combine 5 ingredients in a bowl (after prep of course 😆 ) and season to taste. Now that we’ve gotten my procrastination out of the way, this is why I finally did write a post with the recipe: I make this REGULARLY. It’s a component of many of my recipes. It would be SO NICE to just be able to link to the recipe for the Easy Mango Salsa, saving me time writing, and you time navigating a blog post. As you may know, the hubs and I live in south Texas’ Rio Grande Valley – almost as far south as you can go and remain in the US. We’re not quite to Brownsville, but almost. We reap the benefit of our subtropical climate and proximity to Mexico… especially in the produce department. Mangoes are available year ’round in McAllen, and they’ve made their way into so many of my dishes! Mangoes taste amazing, making it easy to forget they’re also very healthy. They’re packed with vitamins, minerals, and phytonutrients (big word for plant-based nutrients). They’re high in fiber, contain enzymes that can aid in digestion, and plentiful magnesium help keep electrolytes in balance. For more on the health benefits of mangoes, see 28 Science-Backed Health Benefits of Mango. Mangoes are grown all over the globe – Mexico, India, China, Thailand, Indonesia, the Philippines, Pakistan, Nigeria, Bangladesh, Brazil, and the US. They’re considered by many to be the World’s favorite fruit. I’m on board with that! Their bright, sunny, not-too-sweet flavor just can’t be beat. They make a perfect counterpoint to savory dishes, work well in cocktails, perfect a fruit salad, and make desserts sing. A freshquick, and easy mango salsa that perfectly complements your favorite tacos, sopes, etc. Combine all prepped ingredients in an appropriate bowl. Stir to combine, and season. 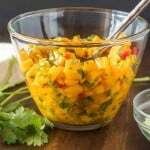 Easy Mango Salsa is best used fresh, but will keep 1-2 days in the refrigerator.